I decided to have some people over the other day, and I’ll be honest – I was absolutely freaking out about what I’d serve. I knew that I only wanted finger food – it’s really hard to cater to everyone’s tastes – and I wanted variety. The answer, tarts! These mini tarts are so easy to make, and you can absolutely go nuts with the filling! All you need for the tart shells are defrosted sheets of puff pastry (you can buy them from the supermarket) and a metal egg ring. The metal egg ring gives you the perfect size of pastry to make a shallow cup at the bottom of a muffin tin. I didn’t do any blind baking – the tarts were fine without it, IMO. And now for the filling. I did three varieties, all in advance, but what you put in your tarts are limited only to your imagination! This is so simple, I never buy ricotta anymore. Heat the milk till small bubbles start to form. Add the vinegar and give it one stir. ONE ONLY. Let it rest for about 15 minutes, then use a slotted spoon to ladle the curd into a clean square of muslin, laid over a colander. Tie the corners around a wooden spoon and hang over a pot/bowl for about an hour. Et voila! Ricotta. 1 litre of milk makes about 250g of ricotta. Squeeze out all the excess water from the spinach. 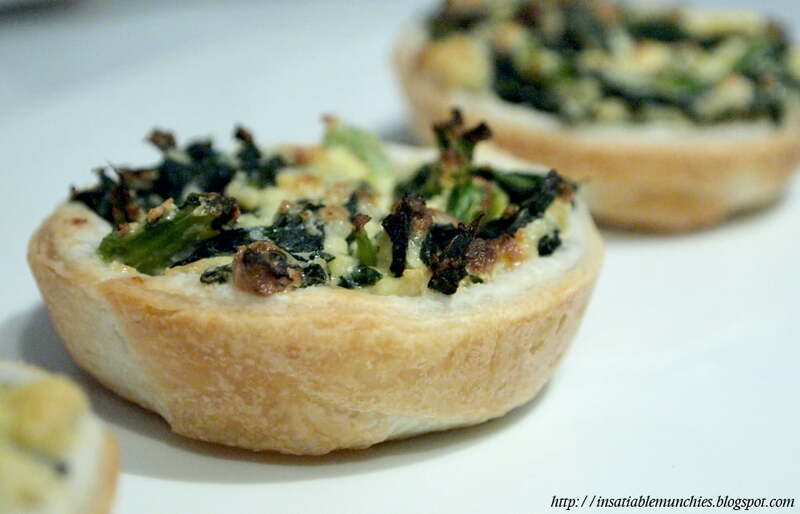 Mix the spinach, ricotta, stock powder, and egg together, and spoon into prepared, raw tart cases. Top, if you like, with grated parmesan, and bake for about 20 min or until golden brown. Finely slice the onions, and finely dice the garlic and chilli. Sauté the onions in the olive oil (over medium heat) with the garlic, chilli and salt until the onions turn translucent. Add the sugar, vinegar and salt to the pan and cook till the mixture reduces. Finally, deglaze the pan with the mirin, and leave to cool. Fill each tart shell and crumble some feta on top. Bake till golden brown. Chop all the ingredients (use as much or as little as you like), and fill tart shells. Top with grated parmesan and bake till golden brown. And that’s it! It’s so easy, and you can serve heaps of people without much worry! How about you? What are your favourite party recipes?